At my house, I kicked off November with a birthday cake! 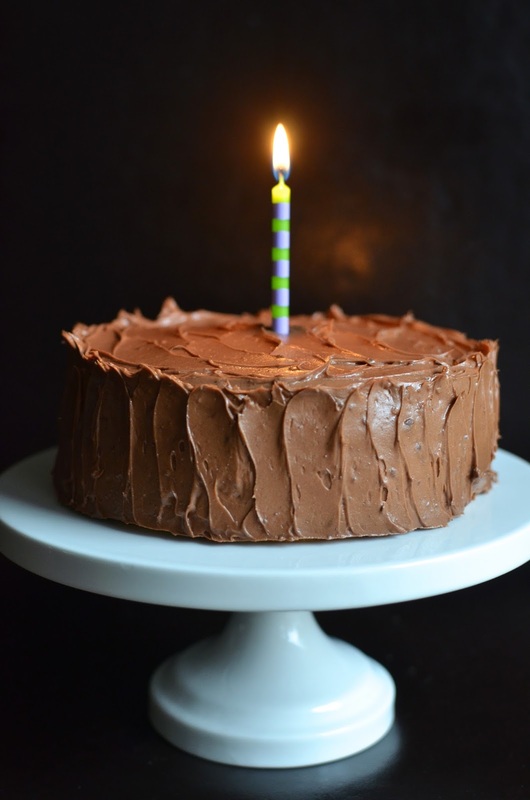 A 6-inch yellow cake with chocolate buttercream frosting...it makes me think: "Birthday"! It's my husband's birthday later this month though that isn't exactly the reason for this cake (although celebrating early and often is a wonderful thing). I'll be making him the chocolate-hazelnut meringue torte for his actual birthday, as per his request, but maybe I've got birthday on my mind or I'm just constantly looking for a reason to celebrate and make a cake (plus, try out a promising recipe) because I just thought to myself...you know, it's somebody's birthday, somewhere! It doesn't have to be your actual birthday to pop a candle on it and celebrate! Are you with me...or am I crazy? I think my family might think I'm a little nutty (my son sure gave me some funny looks when I kept insisting it was his birthday) but I hope you're with me, and I hope this inspires you to pop a candle or two on your next cake and let everyone around you make a wish before digging in. Why not! For this "birthday cake", we're talking about a delicious yellow cake. I haven't had a lot of experience with it but I can now officially say that I have a go-to recipe for moist, fluffy, tender, flavorful, homemade yellow cake. And though I did not grow up eating yellow cake with chocolate frosting as my birthday cake (it was mainly ice cream cakes, then chestnut filled sponge cakes for me), I think of this combination as the quintessential American birthday cake. This little 6-inch cake was very, very well received at my house. My son polished off as much as I would give him and was surprised by how much he enjoyed it. My husband seriously raved about it, which is a good thing since he is the upcoming birthday-boy. He says it's unlike any other yellow cake he's had but I'd argue that it is like the very kind of box yellow cake that we've somehow elevated in our minds. This is the homemade form of how we remember (accurately or not) boxed yellow cake to be. It's moist; it's dense yet light and fluffy, as well as flavorful with the taste of vanilla and rich eggs. It makes for an excellent layer cake in both texture and flavor. You probably won't be surprised that the credit for this great recipe goes to America's Test Kitchen via their Cooking for Two cookbook. No matter if you make it for two or four, you'll probably just wish you had more of this cake and want to double this recipe next time. That's because they've done the legwork and pinned down the right ratio of butter to oil, the ideal amount of buttermilk and eggs needed to give us a homemade yellow cake that has all the light texture of a box cake but with all-natural flavors. For the chocolate frosting, I went with my son's favorite from Beatty's (or Ina's) chocolate cake. I don't mean to doubt the folks at America's Test Kitchen at all but the chocolate frosting this yellow cake recipe was paired with called for double the amount of chocolate I used, as well as a lot more butter, and involved corn syrup. I bet it's delicious but, believe me, the chocolate buttercream I use is tried and true in our house. It is chocolaty and creamy. The beauty of pairing it with this yellow cake is that the contrast makes the chocolate frosting pop. It's worth every calorie as you savor the strong chocolate flavor against the moist vanilla cake. It made me understand why this chocolate-yellow cake combination is such a classic for birthdays, which are like the most important days of our lives (not that I'm being dramatic or anything). So pretend it's your birthday and blow out the candle! I hope you made a wish. And if your wish is to have a great yellow cake recipe, please go ahead and try this one! In case you need further convincing, just look at the moist crumb! Make cake: Preheat oven to 350 degrees, with an an oven rack set in the middle position. Spray two 6-inch round cake pans with baking spray, line the bottoms with a piece of parchment paper, and lightly spray the paper (alternatively, butter and flour the pans). Place egg white into a medium bowl and whisk until foamy (if you have a hand-held mixer, use it at medium-low speed). Continue to beat until egg white turns into a billowy mound, then gradually add 2 tablespoons sugar and continue to beat until glossy, stiff peaks form. Set aside. In another medium bowl, whisk flour, baking powder, baking soda, salt, and the remaining 6 tablespoons sugar together. In a small bowl of measuring cup, whisk buttermilk, melted butter, oil, vanilla, and egg yolks together. Gradually pour the wet ingredients into the dry and mix lightly with a whisk until almost combined (with a few steaks of dry flour still remaining). Scrape the bowl and give the batter another few light whisks to fully combine and make smooth. Switch to a rubber spatula and stir one-third of the egg whites into the batter. Then, fold in the remaining whites until just combined. Divide batter evenly between the prepared pans, smoothing the tops. Gently tap the pans on the counter to release air bubbles and wipe off any drops of batter from the sides of the pan. Bake cakes until a tester inserted in the center comes out clean, about 16-18 minutes, rotating the pans halfway through baking. Make frosting: Place chocolate and espresso powder (if using) in a heatproof bowl set over a pan of barely simmering water. Stir until just melted. Set aside to cool to room temperature. In the bowl of a stand mixer fitted with the paddle attachment, beat the butter on medium-high speed until light yellow and fluffy, about 2 minutes. Add the egg yolk and vanilla, continuing to beat for another 2 minutes. Turn mixer to low, and gradually add confectioners' sugar. Then turn the mixer speed to medium and beat until smooth and creamy, scraping the bowl down as needed. On low speed, add the chocolate to the butter mixture and mix until just blended. Do not whip. Finish cake: Place one cake layer on top of a cake stand or serving plate. Tuck 4 strips of parchment or wax paper under the edges of cake to keep plate clean while frosting. Spread a generous dollop or two of buttercream (about 1/4 to 1/3 of the total) on top and spread evenly to the edge. Top with second cake layer. Continue to frost the top and sides of the cake with remaining buttercream. Gently remove the parchment paper strips before serving. Now this is one delicious cake. Yellow cake with chocolate frosting is my fave! I can see why it's such a classic combo now that I sat down and really enjoyed a good one. Your family is so lucky you make birthday cakes year-round. This one is seriously beautiful! haha - thanks. I do make cakes way too often! Great minds think alike! We can always find a special reason to enjoy cake! This cake was really, really good and I'm talking about yellow cake (you know I'm usually full-on chocolate, same as my son). We were all surprised by how much we liked it! Why not? If it's a birth 'day', then let's celebrate it daily :-)) The cake looks very beautiful, Monica. I'm glad you're in, Angie! Thank you. Oh Monica, what a great post that made me smile. The cake looks delicious, I'd eat 4 slices. ;) It's beautiful - love the sprinkle cheer. And the reason to celebrate.. for anything? What a great idea and gesture. Sending big hugs your way. Aww...your comment made *me* smile, Pamela. Thank you and hugs back your way! Hi Monica, it's always good to have a tried and true on the list, whenever I need to bake a cake, I check your site. Always a great cake. Cake for breakfast is good too! What a sweet thing to say, Cheri! I'm sure you don't need any help from me but I hope I inspire you to eat more cake...and chocolate? ; ) I like the way you think, btw (cake for breakfast for sure!!). Ha! I love this! I'm always looking for a reason to make cake ... this will definitely be my logic from now on! And this cake sounds so so good! Hurray! Cake time! I will take the entire cake please:-) It's raining cakes here too Monica. My boys will be turning 5 next week. Plus our wedding anniversary. Plus Christmas. Plus I am going on a holiday after ages. Plus too much chocolate...ha ha...whatever the reason cake is so mandatorily cumpulsory. Love your cake..if I have the time I am going to make this too. Stunning photos! Oh my gosh - your house seems like such a happy place right now!! Raining cakes!! Love that so much. Happy upcoming birthdays and anniversary...and yay for Christmas and chocolate, and vacations!! Enjoy it all. I'm sure everything is delicious, creative, and beautiful coming from you. Yes, I can see how beautiful is the crumb of this cake...like the simplify of vanilla cake with chocolate filling and frosting...beautifully done Monica! Thanks, Juliana. I guess this is a classic combination for a good reason. Enjoy the rest of the week! I always have room in my life for cake! Half the fun in baking one is making up an excuse to eat it. I am amazed at how moist this is. Definitely need to try! Yum! That cake looks sssooo moist! I love the frosting picture - it literally made my mouth water! Pinned! I am so bad at frosting, Nami, really...this is about all I can do. I'm a one-trick pony. Thank you though. Your cakes could never be ugly! Yes there is always someone's birthday somewhere. and yesterday my niece turned 5. Thanks for this beautiful chocolate cake. Happy 5th birthday to your niece. Children's birthdays are so fun and special, aren't they?! Exactly! Glad you agree. Thanks, ladies! Yes, random birthdays! I love the sound of that. Thanks, Jo! One never needs an excuse to bake a birthday cake! Looks delish! Thanks, Ashley. No excuses needed at all! This is just a classic!! I can clearly see why now. 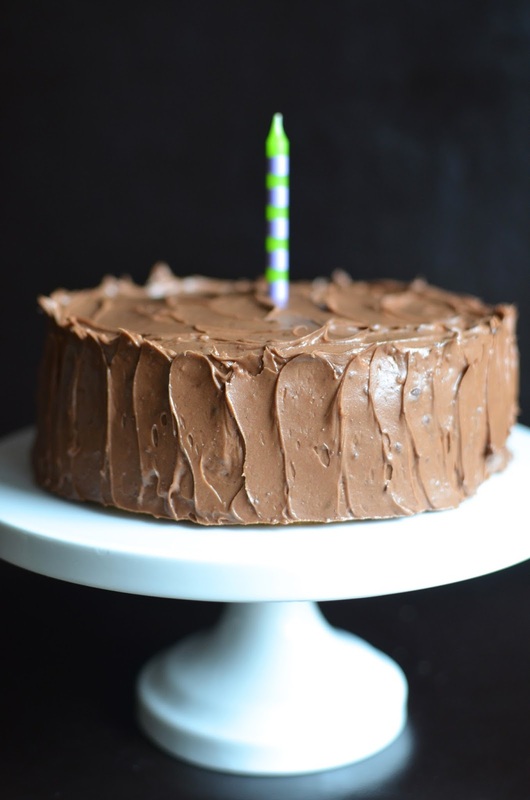 It is always time and room for a birthday cake, especially with chocolate frosting! ;) The cake looks very moist. I bet it is really good! It is crazy moist and flavorful...as a chocoholic, I was really impressed by this yellow cake. It helps that it seems to set off the chocolate frosting, too. Have a great weekend! I love this little cake! As you know, I've had yellow cake with chocolate frosting on the brain this week, too. And I don't think it's weird at all to stick candles in un-birthday cakes! yay for birthday cakes! and cute ones, at that: gotta love a 6-inch cake (my favorite size because it's perfect and doesn't leave you with cake overload). i thought i recognized this as the Sunday Night Cake from Baked, but i was wrong! ATK has such great recipes, and the cake and accompanying frosting (ina makes great frosting) look scrumptious. A 6-inch cake is truly perfectly "manageable" for a small family like mine. We like variety, after all. : ) I was very impressed with this ATK recipe for the yellow cake - I shouldn't be surprised but I was.